SlickText is an SMS marketing platform that enables enterprises and organization build and steer traffic to their business through effective text campaigns. It is a very user-friendly software that offers a plethora of text messaging marketing functionalities and reporting capabilities designed to give your campaigns a boost. It boasts an easy-to-use interface where you can manage your mobile marketing campaigns and facilitate two-way communication with your contacts. SlickText helps users devise and implement SMS marketing campaigns that target high value contacts who are very likely to convert instead of random strangers who may or may not be interested. Other features include polling, voting, auto-replay, and multimedia messaging among others. 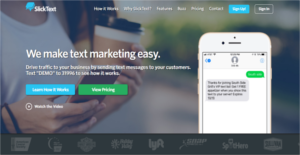 SlickText gives you an SMS marketing software that comes with a number a variety of communication capabilities and tool all created to grow and foster two-way communication with your contacts. While most businesses carry out an SMS marketing plan that sends out messages randomly to consumers, SlickText is different. This software helps you deliver personalized texts that your contacts can relate to or messages that are relevant to them. Aside from offering them products that they might be interested in, SlickText goes extra personal by letting you create and send messages to targeted consumers on their anniversary or their birthdays. The software also lets you set up automated messages and drip campaigns, enabling you to plan text messages way ahead. This SMS marketing platform gives you a wide range of reporting features that allow you to closely monitor your mobile marketing campaigns. You can easily determine which keywords are contributing your traffic and helping you build your contacts list. On top of that, you can see your subscription data, which lets you track opt-in and opt-out information. SlickText also provides top-class customer service support and their agents have proven to be very knowledgeable about their product. Ask them any question or request support and you will get just that. Every enterprise is different, and might call for a specific Marketing Software solution that will be adjusted to their business size, type of customers and employees and even specific industry they cater to. You should not count on getting a perfect app that will work for each business no matter what their background is. It may be a good idea to read a few SlickText reviews first and even then you should keep in mind what the service is supposed to do for your business and your staff. Do you need an easy and straightforward solution with just elementary functions? Will you really use the complex functionalities needed by experts and big enterprises? Are there any particular features that are especially beneficial for the industry you work in? If you ask yourself these questions it will be much easier to locate a trustworthy service that will fit your budget. How Much Does SlickText Cost? We realize that when you make a decision to buy Mobile Marketing Software it’s important not only to see how experts evaluate it in their reviews, but also to find out if the real people and companies that buy it are actually satisfied with the product. That’s why we’ve created our behavior-based Customer Satisfaction Algorithm™ that gathers customer reviews, comments and SlickText reviews across a wide range of social media sites. The data is then presented in an easy to digest form showing how many people had positive and negative experience with SlickText. With that information at hand you should be equipped to make an informed buying decision that you won’t regret. What are SlickText pricing details? What integrations are available for SlickText? If you need more information about SlickText or you simply have a question let us know what you need and we’ll forward your request directly to the vendor.